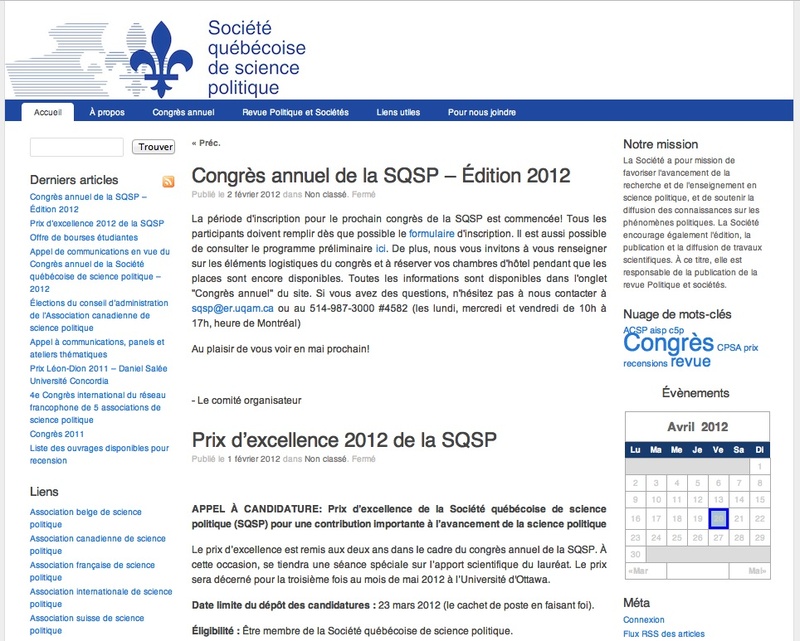 The Société Québécoise de Science Politique (SQSP) promotes research and teaching of Political Science and supports the development of the discipline with a specific interest in the French-speaking world. Therefore its website (whose pages are available only in French) provides all necessary academic information about the activities of the society, mainly congresses, seminars and conferences. The Quebec Political Science Association also encourages the publication and diffusion of scientific contributions, being responsible for publishing the society’s Revue Politique et Sociétés, whose abstracts (from 1991) and full-text articles (from 2002) are available online through “érudite”, a canadian non-profit inter university consortium platform, although not sistematically. The SQSP also publishes, in co-operation with the Canadian Association of Political Science, the “Revue canadienne de science politique”. A long links list to other Political Science associations and to (mainly Canadian) research centres and universities is provided. The SQSP website is extremely easy to navigate so that no help tools are needed for locating the desired information.